Located in the East of the country, Iceland accommodation doesn't get any better than the Blafell Hotel in Breiðdalsvik. The hotel seems to capture all the beauty of Iceland thanks to its positioning, so guests can enjoy the countryside, seashore, valleys and mountains all right from the hotel. 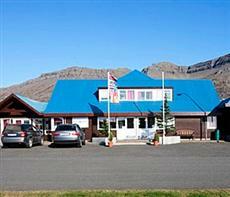 This Breiðdalsvik area hotel is located right on the south fjords in the East of Iceland which gives it an advantage among other ares. This secluded oasis of serenity is just nearby a small village which has the many conveniences you may need such as a gas station, local store, bank, post office and even a seasonal crafts market. Depending on what sparked your desire to visit one of the most beautiful mountain range views of all of Iceland, you may want to spend most of your time right there at the Blafell Hotel and you can. The hotel features a cozy fireplace where you can chat the evening away, sauna perfect for relaxing after a day of hiking and even a restaurant which serves up Icelandic culinary specialties. The views are unbeatable, staff delightful and location is just plain perfect.